It has been almost 3 months since my last post. I have done some baking within that time but I haven't had the time to sort through photos and write about them. I am hoping to complete my MSc within the next year so I've been really scaling down on the baking projects. I do certainly miss it as a creative outlet but I'll get back to it soon enough. In the meantime, I will be posting a few projects that I had done in the summer. 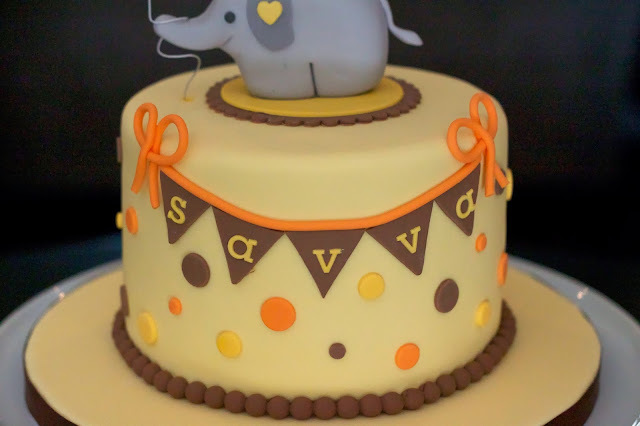 This was an elephant-themed birthday cake for the first birthday of a friend's son that I made back in July. I apologize for the grainy photo quality. I didn't check the settings on the camera before I started taking photos so I didn't notice that the ISO had been set really high. My friend really liked the elephant cake that I did for a baby shower back in March. 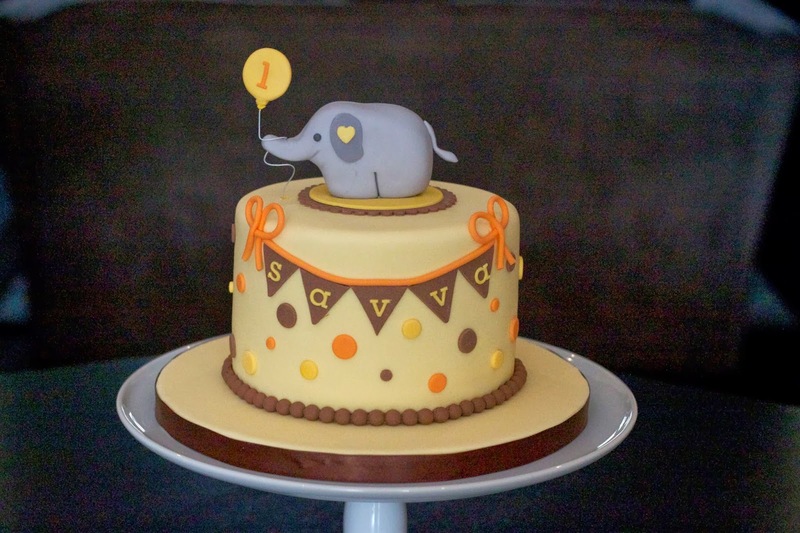 The birthday boy's favourite colour is yellow and we thought that brown would be a nice contrast colour. I wanted to make the cake a little different from the other elephant and decided to do a 3-dimensional elephant instead. I've made 3-D animals in the past and they usually consist of a separate body, limbs and head. 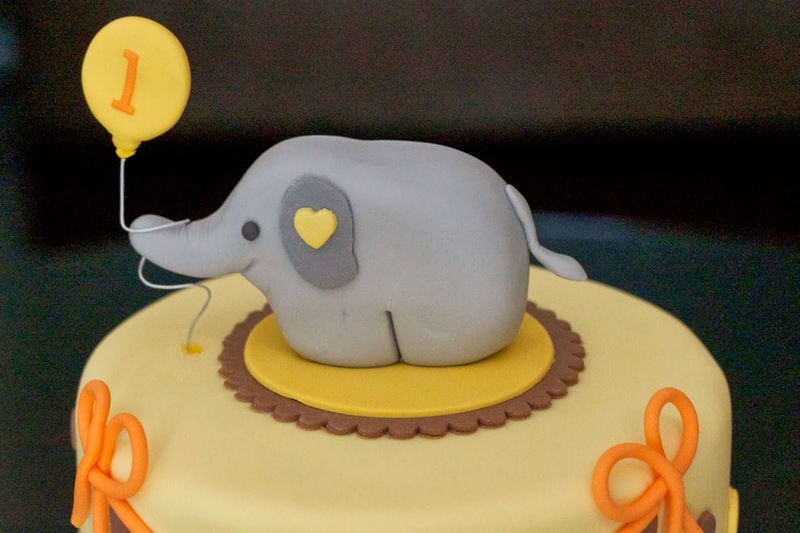 For this cake I wanted to keep the "Republican" elephant shape, meaning that it had to be formed with one piece of fondant. 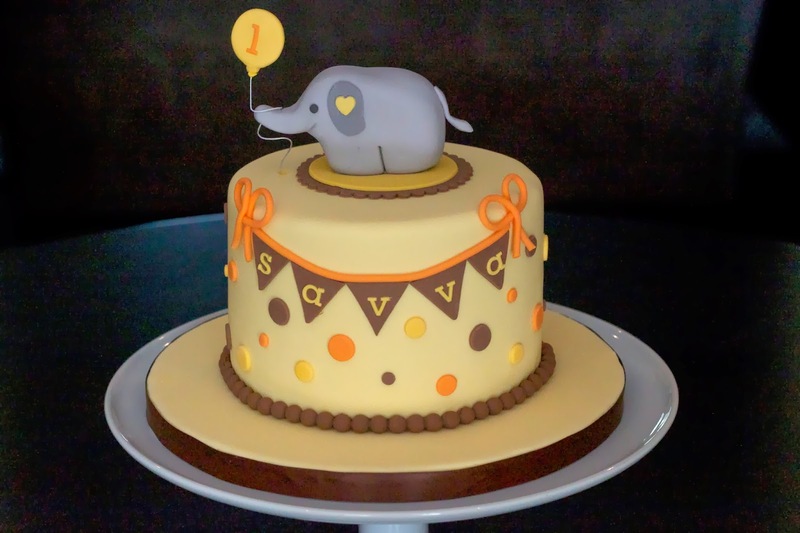 It was harder than I thought to manipulate the one piece of fondant into the desired shape, particularly with the trunk. The fondant that I use dries rather quickly and it was mixed with tylose for stability, so I really had to work fast. It took a couple of tries before I was satisfied with the shape. In retrospect, I wonder if it would have been easier to use modelling chocolate as it is easier to manipulate without seams and wrinkles. The balloon was made from gumpaste for fast drying and attached to floral wire. I had to make the balloon fairly thin as the floral wire was a higher gauge (thinner) and I wanted it to be able to support the balloon without putting any weight on the elephant's trunk. In the future I will keep some heavier gauge floral wire on hand. I wrote the birthday boy's name out on little modelling paste circus flags and used an extruder for the fondant 'string' and bows. The flavour was a rich chocolate cake with raspberry swiss meringue buttercream. For the buttercream I used thawed frozen raspberries, pureed them and then strained them for a fine mesh sieve to get rid of all of the seeds. It was a subtle raspberry flavour. If you want a more concentrated flavour you could probably reduce the puree on the stove and allow to cool before adding it to the buttercream. Such an amazing cake you made. I got a similar one made for my daughter for her 14th birthday and she just loved it. Going to try this one next time and see how it goes. "There's a hair on this cake"